Recent analyses (Havriluk, 2003) have shown wasted hand motion in the strokes of swimmers of all ability levels, even including world class. In addition to having a negative impact on performance, wasted motion can also stress the body in a manner that causes injury. 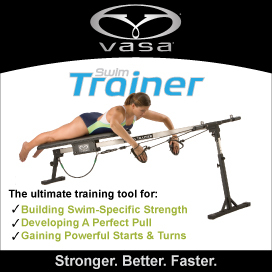 The greater the wasted motion, the greater the average hand force that is necessary to swim at the same velocity, and the less effective the technique. The purpose of this study was to determine if the active drag coefficient can serve as a measure for quantifying the effectiveness of swimming technique. Faster swimmers often display more effective technique than slower swimmers. Older age group swimmers are usually more skilled than younger swimmers. It was hypothesized that faster swimmers would have a lower drag coefficient than slower swimmers and that older swimmers would have a lower drag coefficient than younger swimmers. A total of 562 male and female swimmers between the ages of 9 and 16 were analyzed with Aquanex. (The testing procedures were originally described and validated in Havriluk, 1988.) Average hand force and swimming velocity were calculated. The coefficient of active drag (Cd) was calculated from the equation: Cd = 2D/rAv2, where D is the drag force (assumed equal to the average hand force for constant velocity swimming), r is the mass density of water, A is the cross-sectional area of the body, and v is the swimming velocity. The ten fastest swimmers in each of four age groups (9&10, 11&12, 13&14, 15&16) of both genders were assigned to the faster performance level group. The second ten fastest swimmers were assigned to the slower group. An ANOVA was applied with a performance level by gender by age group (2 x 2 x 4) design. There was a significant performance level difference of .11 in the active drag coefficient (.46s), F(1, 144) = 17.233, p<.001. There was also a significant difference between the 9&10 and 11&12 age groups and between the 11&12 and 13&14 age groups. The results support the hypothesis that faster swimmers have a more effective technique than slower swimmers. The results also show an improvement in technique with age. The coefficient of active drag was found to be a valid measure for the effectiveness of swimming technique. The fact that there was no improvement in the drag coefficient of the teenage subjects is an indication that an additional focus on technique instruction is appropriate for these ages.